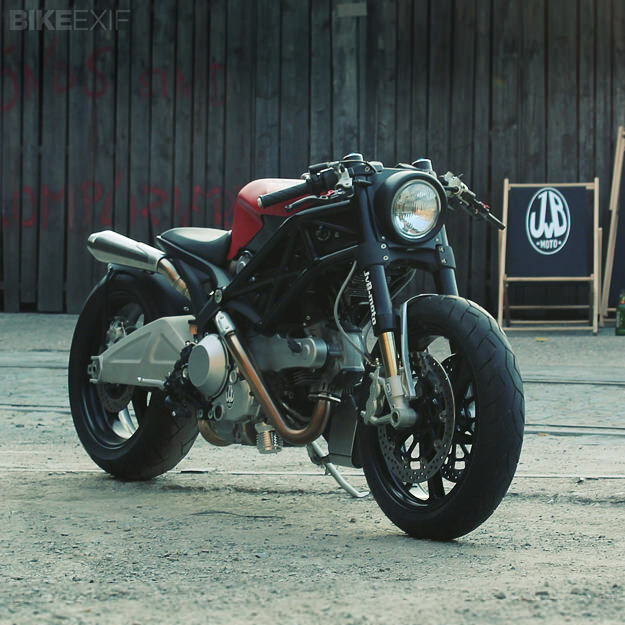 Jens then built Flat Red for real, and the bike launched his company JvB-Moto onto the European custom scene. He’s now an established builder with a string of stark, brutal-looking machines to his name. A few days ago, at the Glemseck café racer festival in Germany, Jens revealed Flat Red II—and here it is. 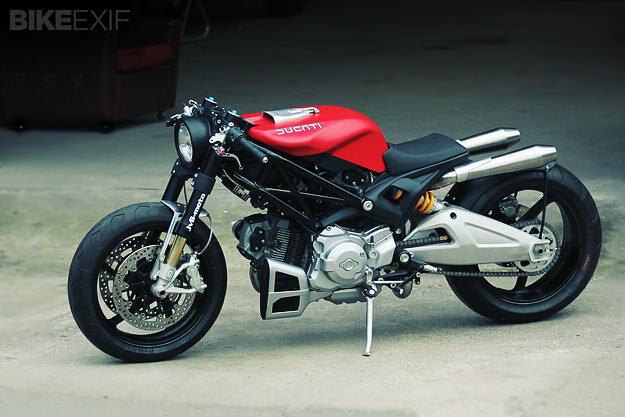 It’s based on a Ducati Monster 1100, and sports an aluminum tank with a carbon cover. 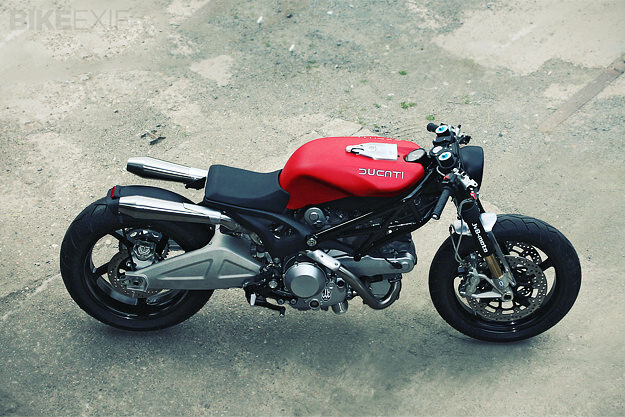 The emphasis was on saving weight—the bike hits the scales at just 150 kg, but packs a cool 100 bhp, thanks to a custom exhaust and a Termignoni ECU. Flat Red II is no show pony: there’s Öhlins suspension all-round, and forged OZ wheels help to reduce weight still further. 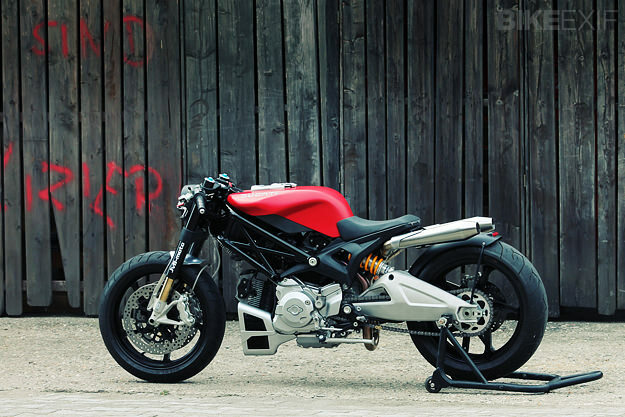 The swingarm is a modified Monster 696 item that conceals a compact li-ion battery. 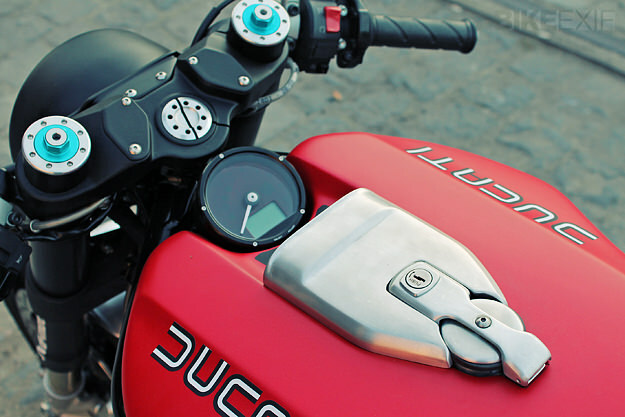 The brake fluid reservoirs are now located inside the top yoke, in place of the usual handlebar rubber mountings. Hand-made aluminum parts are everywhere, from the oil cooler housing to the air intake to the front fender. The rear fender and headlight surround are carbon fiber, and the electrics are hidden within the shell of the new tank. Flat Red II was a commission, but it’ll be the last of its type. “It’s a one-off,” Jens says firmly. A shame, but you can get an additional fix of Jens’ work in our archives—and stay in touch with JvB-Moto news via Facebook.